The Sudanese military attempted to break up an anti-government sit-in Monday outside its headquarters in the capital, Khartoum, but backed off, organizers behind the protests said. Later in the day, the African Union gave Sudan’s transitional military council 15 days to hand over power to a “civilian-led political authority” or face suspension from the union’s activities. There were no clashes and no one was hurt in the attempted dispersal, but the incident set off concerns that the military, which last week ousted Sudan’s longtime President Omar al-Bashir after four months of street protests against his rule, could renege on its promises not to use force against the peaceful demonstrators. Some protesters are then seen in the footage sitting down on the ground in front of the soldiers who subsequently back off. “Revolution,” protesters also chant in some of the videos, as well as slogans against al-Bashir’s Islamist supporters. 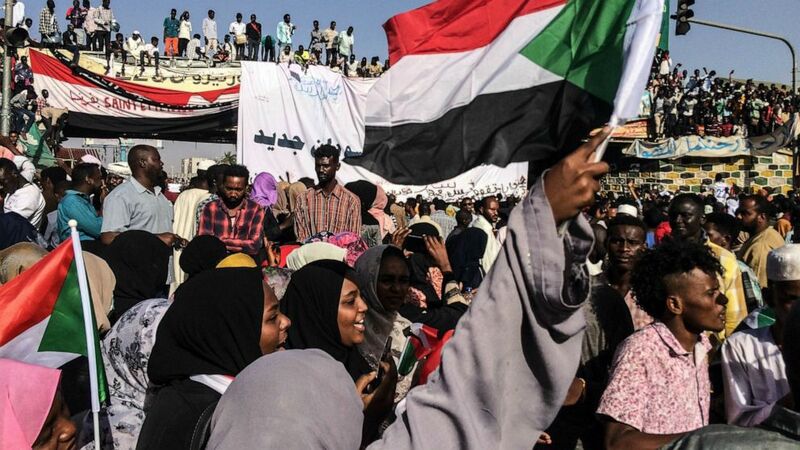 Protester Nourhan Mostafa said the sit-in will continue until “the demands the Sudanese revolution are met.” She repeated protest organizers’ calls for handing over power to a four-year transitional civilian government and the release of all political prisoners. Also Monday, Gen. Abdel-Fattah Burhan, the head of the transitional military council, announced an overhaul the military leadership and appointed a new chief of staff, according to a statement from the military. The statement said Gen. Hashem Babakr was appointed the joint chief of staff, replacing Gen. Kamal Abdel-Marouf al-Mahi who was ousted along with Defense Minister Awad Mohammed ibn Ouf a day after al-Bashir’s overthrow. Since his ouster, al-Bashir — a president of nearly 30 years — has been under house arrest in Khartoum. After his ouster, which the military said was in response to the demands of the people, the army appointed a military council to rule for two years or less while elections are organized. Protesters, who are in talks with the military council, fear that the army, dominated by al-Bashir appointees, will cling to power or select one of its own to succeed him. Protest organizers have urged the military to “immediately and unconditionally” hand power to a transitional civilian government that would rule for four years. The military on Sunday urged opposition parties and movements to name a civilian prime minister and Cabinet but not a president to help govern the country. “Most pressingly, the continuing peaceful protests must not be met with violence from any quarter,” the statement said. The uprising began in December as a series of protests against the rising costs of fuel and food, but soon shifted to calls for al-Bashir to step down. Dozens of people were killed in security crackdown aimed at quashing the protests. The protests against al-Bashir gained momentum after Algeria’s President Abdelaziz Bouteflika, in power for 20 years, resigned earlier this month in response to weeks of similar protests.